SOLAR IMPULSE Solar Powered Plane Takes Off! Solar power just made aviation history, as two Swiss adventurers revealed a prototype for a solar-powered aircraft they hope will be the first to fly around the globe in 2011. The Solar Impulse prototype was just unveiled yesterday and is an amazing feat of design and engineering. Made from light-weight and super strong carbon fiber, and covered with a thin layer of high powered photovoltaics, the plane has a wingspace of 262ft from wing tip to wing tip (about the same width as the new A380 Super Jumbo Jet). However, while the metal Airbus A380 weighs a whopping 580 tonnes, the dainty carbon fiber Solar Impulse weighs just 1.5 tonnes – which seems almost kite-like compared the gigantic heavy planes of the past. The Solar Impulse is one of the most ambitious aviation projects of recent times and could revolutionize air travel. However, while the superjumbo can currently carry more than 800 passengers and has a top speed of more than 560mph, the Solar Impulse will seat just one and will reach only about 40mph, at which speed a round-the-world flight will take about four weeks. So it looks like solar powered commercial air travel is still quite a ways off. The Solar Impulse, engineers are relying on the battery capacity of the plane – which will store the energy generated during the day to keep the plane alight at night. The ultra-thin solar cells integrated into the wings will be used to collect sunlight and convert it into energy to power the four electric motors. While pilotless military drones such as the Zephyr have already accomplished the feat of flying through the night, it is far more difficult with the added size and weight of a pilot on board. The 94 million-dollar project aims to emulate the achievements of aviation pioneer Charles Lindbergh who made the world’s first solo, non-stop transatlantic flight in 1927. The project’s goals include a transatlantic crossing in 2011 before what would be a historic, fuel-less circumnavigation of the globe. Lets hear it for solar power!! Brilliant. Great info to get my students THINKING. Solar power just made aviation history, as two Swiss adventurers revealed a prototype for a solar-powered aircraft they hope will be the first to fly around the globe in 2011. The Solar Impulse prototype was just unveiled yesterday and is an amazing feat of design and engineering. Made from light-weight and super strong carbon fiber, and covered with a thin layer of high powered photovoltaics, the plane has a wingspace of 262ft from wing tip to wing tip (about the same width as the new A380 Super Jumbo Jet). 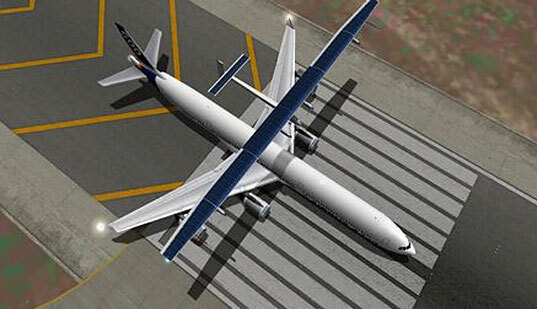 However, while the metal Airbus A380 weighs a whopping 580 tonnes, the dainty carbon fiber Solar Impulse weighs just 1.5 tonnes - which seems almost kite-like compared the gigantic heavy planes of the past.